Product information "HI97735 Total Hardness Photometer - METER ONLY"
The HI97735 Total Hardness Photometer combines accuracy and ease of use in a simple, portable design. 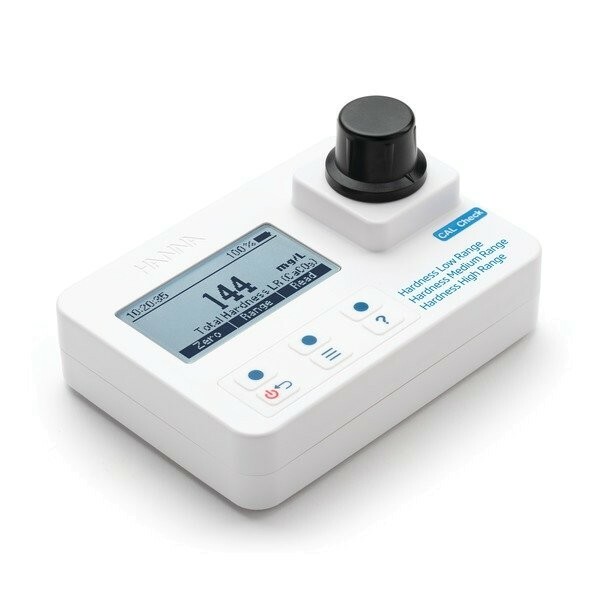 The advanced optical system provides lab-quality accuracy while its user-friendly design is easy for any user making it the perfect photometer for your water quality testing needs. The HI97735 meter measures total hardness in water samples up to 750 mg/L (ppm) CaCO3. We believe that buying a meter should be simple. Your HI97735 photometer has many of the necessary accessories needed for successful measurements. Upgrade to the Total Hardness Photometer Kit (includes the CAL Check Standards) for the most economical option for testing. Hardness LR: 0 to 250 mg/L; Hardness MR: 200 to 500 mg/L; Hardness HR: 400 to 750 mg/L (ppm) CaCO? 1 mg/L from 0 to 750 mg/L (ppm) CaCO? Related links to "HI97735 Total Hardness Photometer - METER ONLY"
Customer evaluation for "HI97735 Total Hardness Photometer - METER ONLY"